Lung cancer is the deadliest cancer in the U.S.
An estimated 158,080 Americans will die from lung cancer in 2016, according to the American Lung Association. Asbestos is a rare cause of lung cancer, and it accounts for about 4 percent of all U.S. lung cancer cases. Smoking is most commonly associated with lung cancer and for right reason — it is linked to 90 percent of all cases and deaths. But you don’t have to smoke to get lung cancer. 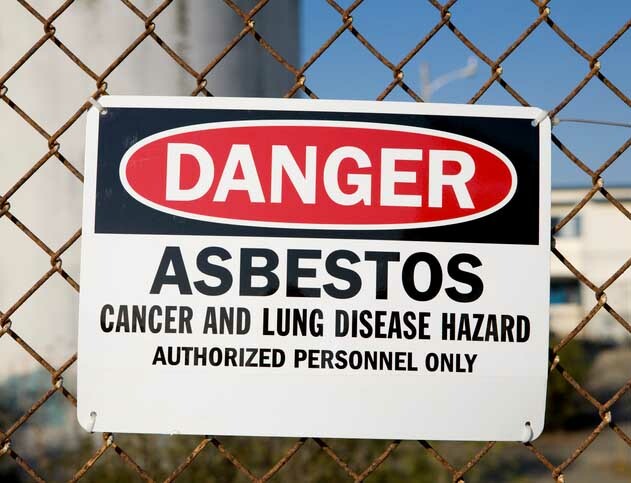 While rare, it is important to know some key facts about lung cancer caused by asbestos. How Does Asbestos Lung Cancer Develop? Typically, asbestos-related lung cancer develops after frequent and long-term exposure to asbestos, a naturally occurring mineral. The majority of exposures occur in occupational settings. When someone disturbs asbestos or asbestos-containing products, toxic fibers become airborne. If inhaled, these fibers can become trapped in the lungs where they can remain for decades, leading to scarring, inflammation and possibly lung cancer. What Occupations Are Linked to Asbestos Lung Cancer? The most common occupations associated with asbestos exposure are in industrial trades. Materials containing high concentrations of fibrous asbestos still exist in older buildings, putting construction workers, roofers, insulation workers, electricians and plumbers at risk. Former factory workers at textile plants, manufacturing plants, paper mills and power plants were likely exposed to asbestos products. Military veterans, especially those who worked on naval ships before the mid-1970s, are considered at high risk for asbestos lung cancer. Other risky occupations include auto mechanics, HVAC mechanics, firefighters and toll booth workers. What’s the Latency Period of Asbestos Lung Cancer? It can take up to 35 years after initially being exposed before the onset of asbestos lung cancer. Typically, it takes at least 10 years, at a minimum, to develop, but studies show most development occurs between 30 and 35 years. Are All Lung Cancers the Same? No. There are two primary forms of lung cancer. Small cell lung cancer (SCLC) typically originates in the bronchi near the center of the chest. Non-small cell lung cancer (NSCLC) is the most common type of all lung cancers, making up 80 percent of all cases. SCLC is more aggressive and more difficult to treat than NSCLC. Also, NSCLC comes in three primary subtypes. Adenocarcinoma is the most common of the subtypes among nonsmokers. How Is Asbestos Lung Cancer Diagnosed? To diagnose asbestos lung cancer, a doctor may perform one or multiple of the following: X-ray, a bronchoscopy, biopsy or sputum cytology. Because of the long latency period and common early symptoms that might mirror a less serious condition, asbestos lung cancer is typically diagnosed in the later stages of the cancer. Asbestos lung cancer has overlapping symptoms with other asbestos-related diseases such as asbestosis and mesothelioma. These include difficulty breathing, coughing, chest pain and fatigue. Prognosis depends on several factors, including stage of the cancer, a patient’s age and overall health, but the average prognosis for lung cancer is about 16 months. Like prognosis, treatment depends on multiple factors, mainly the stage and the type (small cell or non-small cell) of the cancer. Potential curative treatments like surgery are usually possible for early stages before the cancer has spread, while common palliative treatments like chemotherapy make symptoms more bearable while improving outlook for patients in later stages. How Does Smoking or Other Factors Play a Role? Smoking and asbestos exposure only increases the risk of developing lung cancer by up to 90 percent, not asbestos-related diseases in general. Asbestos and smoking work together synergistically. Both expose our lungs to dangerous carcinogens. Inhaling harmful chemicals from cigarette smoke can have a greater impact on lungs already damaged by asbestos. The American Lung Association estimates that a person with a history of asbestos exposure who also smokes is 50 times more likely to develop lung cancer than nonsmokers not exposed to asbestos. Nonsmokers with a history of asbestos exposure are five times more likely to develop lung cancer. Exposure to secondhand smoke also increases risk among those with a history of asbestos exposure. Mesothelioma is a respiratory cancer, but not a type of lung cancer. Pleural mesothelioma, the most common of the four types, forms on the protective lining of the lungs, called the pleura. Even if you don’t smoke, you could be at risk for lung cancer. If you have been exposed to asbestos in the past and have symptoms such as trouble breathing, coughing or chest pain, consult a doctor immediately. If you do smoke, seek help to quit. Smoking-related lung cancer is the most preventable of all cancer deaths. Also, there is a multiplicative effect between smoking, asbestos exposure and lung cancer. While avoiding asbestos can prove to be more difficult, caution should be taken to avoid unnecessary exposure. People with a history of asbestos exposure and smoking are at the highest risk for developing lung cancer or another asbestos-related illness. Early detection is key with lung cancer and mesothelioma. Consider regular screenings to catch cancer growth before it becomes advanced and spreads.